Feedly became my blog consolidation tool of choice when Google Reader shut down in 2013. If you are still looking for a good alternative, see the LifeHacker post "Five Best Google ReaderAlternatives". 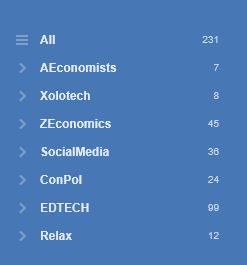 Feedly allows me to track and read 132 different blogs. Blogs are organized into categories and each morning I get a count of fresh articles. I collect ideas as small as a sentence, up to entire articles. OneNote is critical to my workflow, but it does not work with Feedly the way that you might expect. Here is how to collect ideas leveraging Feedly and OneNote. PRO: Open an article on Feedly, select the text your want, right-click to copy, then move to OneNote and right-click to paste. The quick and easy method to capture ideas. The text is searchable and OneNote provides the URL pointing to the Feedly subscription. CON: Quick and Easy usually means something is missing. The URL (highlighted above) points to the Feedly subscription, not to the source article. If you collect notes and post on the same day this may not be an issue. But wait a few days, or mark the article as "read" and the link will not take you to the article. You will have to spend time searching for the information. OneNote provided a link to Feedly (correct functionality), but what you really want is a link to the source. Quick Tip: Scroll to the bottom of the page in Feedly and click "Visit Website" then copy and paste from the original source. When reading an article Feedly has a small icon that will add a simple flag to indicate "Saved For Later". You can see all of your Saved For Later articles by clicking the menu link in the left navigation. In the All Content view the flag shows up in the first column. When you click the "All" menu item, Feedly returns the list of unread items, or if everything is read, returns the list of all articles - newest items at the top of the list. Flags work for quick and easy collection. CON: This function does not work for me (OneNote 2013, on a corporate network), and it requires a subscription. When you click the OneNote icon, Feedly will save your article directly to your notebook. I'll provide a free alternative below as a bonus. PRO: Several other sharing options live under the overflow menu (three vertical dots) on the far right. Select your favorite tools and they will appear under the menu. Sharing an entire article in your favorite social media channel is simple. In the image above you can see an email icon and a the Twitter icon. When the email icon is clicked your email client is triggered and you can add contacts to the To: line. You can edit the Subject and the body, and Twitter inserts a link to the article. When the Twitter icon is clicked Feedly creates a pop-up window with the title of the article, the URL, and if you chose it on the Preferences page, a hashtag based on the name of your grouping. You can edit prior to sending. Select your favorites, they are added to the Menu above Feedly articles. CON: Certain pop-up functionality may be blocked on a corporate network. For example, I cannot access external email accounts (Outlook.com, Gmail, etc), so the email feature cannot be used when I am at work. I hate paying for simple integration tools (like the OneNote link in Feedly). If This Then That (IFTTT) lets you design simple "Recipes" to perform these tasks. Plenty of pre-scripted recipes are available for Evernote, Google Docs, Gmail, Buffer… If you can’t find one you like, build your own! My recipe takes any Feedly article that I mark "Saved for Later" and creates a new page in a OneNote notebook that I keep online. The Body of the recipe can be customized from a pick list. I capture ArticleTitle, ArticleURL, ArticleContent etc. and everything is stored in date order in my notebook. Feedly is my tool for managing blog subscriptions. Ideas enter the top of my workflow and are stored in OneNote. OneNote allows me to sort, tag, and recombine ideas for my blog. I can create content, provide proof from experts, and make proper attribution at the same time. Knowing how OneNote works with Feedly, and knowing a few alternatives to improve idea collection will make your workflow powerful. XOLOTECH by Myllyons LLC is licensed under a Creative Commons Attribution-ShareAlike 3.0 Unported License. (c) 2015 See Creative Commons Link for details. . Simple theme. Powered by Blogger.